Cornelis Cornelisz, who himself added ‘van Haarlem’ to his name, was one of the leading figures of Dutch Mannerism, together with his townsman Hendrick Goltzius and Abraham Bloemaert from Utrecht. He was born in 1562 in a well-to-do Catholic family in Haarlem, where he first studied with Pieter Pietersz. At the age of seventeen he went to France, but at Rouen he had to turn back to avoid an outbreak of the plague and went instead to Antwerp, where he remained for a year with Gilles Coignet. The artist returned to Haarlem in 1581, and two years later, in 1583, he received his first important commission for a group portrait of a Haarlem militia company (now in the Frans Hals Museum, Haarlem). From roughly 1586 to 1591 Cornelis, together with Goltzius and Flemish émigré Karel van Mander formed a sort of “studio brotherhood” which became known as the ‘Haarlem Academy’. In the 1590’s he continued to receive many important commissions from the Municipality and other institutions. Before 1603, he married the daughter of a Haarlem burgomaster. In 1605, he inherited a third of his wealthy father-in-law’s estate; his wife died the following year. From an illicit union with Margriet Pouwelsdr, Cornelis had a daughter Maria in 1611. Around 1630, Maria married the silversmith Pieter Bega, and in 1631/32 their son was born, Cornelis Bega, who became a painter. After a very successful career, Cornelis died in 1638, leaving all the red chalk drawings and half of his estate to his only child Maria, while the other half went to Margriet Pouwelsdr. He had at least nine pupils of whom Gerrit Pietersz Sweelink, Cornelis Jacobsz Delff and Salomon de Bray are the best known. Cornelis painted mainly religious and mythological subjects and portraits, and between 1588 and 1602 produced designs for 22 prints. In the last years of his life he abandoned the life size figures in his work and, instead, chose to paint small scale histories and genre scenes. This previously unrecorded painting, dating from 1604, is a mid-period work by Cornelis van Haarlem and is characteristic of the moderate classicism which informed his work from around 1600 onwards. It represents a stark contrast to the exhuberant Mannerism of his youthful oeuvre, exemplified by his early masterpiece, The Massacre of the Innocents, now in the Frans Hals Museum, Haarlem. 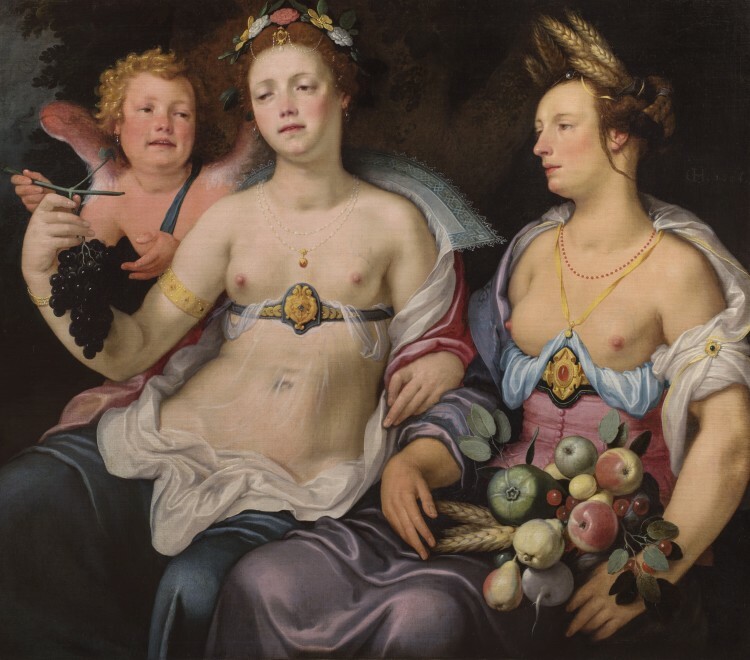 In the 1580s, Cornelis, together with the poet, painter and art theorist, Karel van Mander, and the painter and engraver, Hendrick Goltzius, was one of the principal exponents of Mannerism which saw a brief but intense flowering in Haarlem. By the mid 1590s, however, Cornelis’s work was already becoming more temperate, in response to Gotzius’s own rejection of Mannerism. The violent contortions and exaggeratedly muscular nudes which typified his Mannerist period, gave way in favour of more restful poses and figure types, more akin to classical norms of proportion and harmony. Sine Cerere et Baccho friget Venus, Latin for “Without Ceres and Bacchus, Venus Freezes,” is a quotation from the Roman comedian Terence (circa 195 /185 – 159 BC). This became a proverb, the simple level of meaning which is that love needs food and wine to thrive. This subject was often shown in art, especially in the period 1550-1630, in Northern Mannerism in the Court of Rudolf II in Prague and the Low Countries, and particularly in the Dutch city of Haarlem. Goltzius, Rubens, Hendrick Bloemaert, Joachim Wtewael, and Bartholomeus Spranger were just a few of the artist who treated this theme. Cornelis painted the subject at least two other times, one of 1614, now in the Staatliche Kunstsammlungen, Dresden, and another of 1624, now in the Palais des Beaux-Arts, Lille. The present work is the artist’s earliest known treatment of this theme.